Bloombastic combines biological minerals with biological stimulants to produce a PK 20/21 formulation – much stronger than many other PK boosters on the market as well as a whole host of vitamins and minerals designed to boost your yields by increasing both the number of flowering sites on your plants and the density of your buds! Bloombastic may be highly priced in comparison to some other nutrients available but the reality is that Bloombastic replaces not only your flowering booster but your PK booster and is incredibly concentrated. At a dilution rate of 0.5 – 1ml per litre one bottle of Bloombastic will last you much longer than other competitive nutrients! 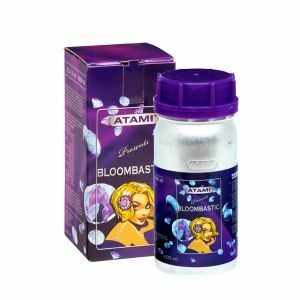 Bloombastic is to be used during the last four to six weeks of bloom and is compatible with any nutrient range, taking the place of the PK booster and flowering stimulator. No matter what nutrient range you use give Bloombastic a try and see what it can do for your yields!